You may have come across a YouTube video in the internet – that of prison inmates dancing to Michael Jackson’s thriller, Black-Eyed Pea’s music, or to the song “I Will Follow You” popularized by Whoopie Goldberg’s movie, the Sister Act. This is not a joke, this is for real. This particular prison is located in the city where I come from – Cebu, Philippines. (I’ve been to this prison many, many years ago having done prison cell ministry in the past). This phenomenon, if you may, is revolutionizing the concept of “rehabilitation”. Apparently, the music and dance-exercise have lessened the violence inside the prison walls and have been showing positive psychological/emotional effects on a lot of the detainees. 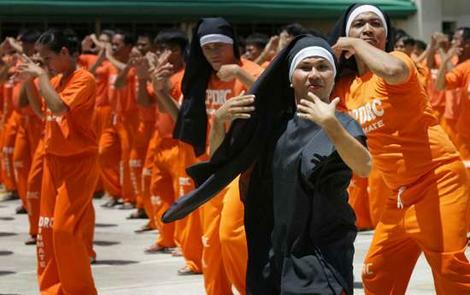 No less than 1,500 inmates both men and women alike – and serious criminals at that – are “catching on the tune” and have been able to put up huge dance productions such as what you see in the video attached to the article below. Their videos have garnered millions of hit in YouTube and are catching the attention of both the local and international media like CNN. I’m not sure if this is something to be proud of, but I want to share this story nevertheless, because this sure is another testimony of the Filipinos’ ingenuity and our inherent (positive) trait of being able to laugh at ourselves and find something light-hearted and funny out of the most serious / threatening situation. Read the article and see their latest dance, “Electric Dreams”. The video has not even been uploaded in YouTube yet. Just click on the link below. Very interesting article!I enjoyed reading it. Alex showed me that youtube video a couple weeks ago…I thought it was hilarious! I think it’s pretty awesom that it’s actually helping out these prisoners so much. isn’t it interesting? the warden said in his interview that somebody from the US said it wouldn’t work, but it did. now they want to hire him! hahhah… the dancing is from our latin heritage. Filipinos can sing and dance (most, anyways).